To start, I have to say, the whole concept of having these beauty boxes (and fitness, health, food, etc boxes) are an amazing idea! Sure, there is the fear of “I don’t know what’s going to be in it, so how will I know if I like it! ?” Trust me, I had the same thoughts running through my head, and so I checked out different companies and their websites and feedback before ordering anything. Plus, even though you don’t know what’s included, you usually get double the value of the money you spend per box. I decided to sign up to pay monthly, just in case I wanted to cancel at any point. Most of these companies offer slightly reduced rates if you sign up for 3-months, 6-months or 12-months at a time, but just make sure you love the contents before doing so! 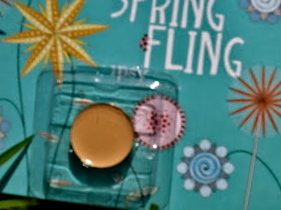 This light minty-green polish seems perfect for this Spring-themed bag! Although my first preference would be the white or pink shade rather than this minty green, I think I will definitely end up using it. I just recently tested it out on my own nails and it seems to go on smoothly, similar to an Essie/OPI quality polish which is actually shocking, however my nails never look as good when I do them myself versus getting them done at a salon, so of course a few of mine smudged. I think it would look better if I had a tan as well, since it’s such a light color. It would be a great one to use as a base and then put designs on (just wait for my future post on nail polish colors and designs!) In terms of the brand, most of the other Ipsy girls I’ve seen posting on the website threads seem to enjoy it and recommend it to their friends. Rating: 4.5/5 stars, as it’s not my absolute favorite color but is definitely a good polish and worth getting. 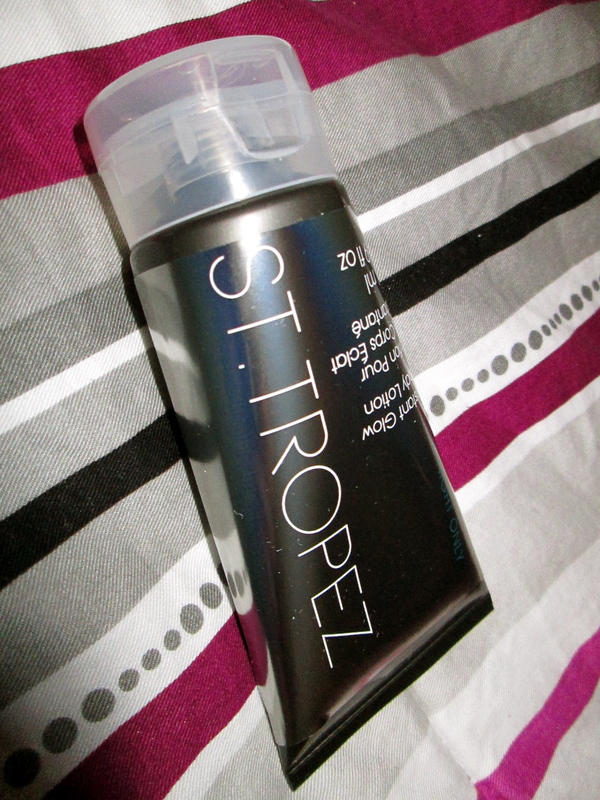 Many people recieved a bronzing or luminating lotion from Pacifica, however I recieved a sample size of St Tropez instead (I’d say enough for 1 full body application, or a few partial applications). I have yet to apply this to my entire body (or at least chest/arms/face if I’m going out and wearing pants!) but based on testing some out on my skin, I think it has potential. It is a well-known, and often expensive brand, so I was quite giddy when I received it in my package. The only downside, is that I already previously received this sample through Sephora, and hadn’t had a chance to use it (so now I have 2!). ALSO: You must must must wear gloves or a bronzing mitt! I tested it out on my skin and had to scrub my fingers after only having the lotion on them for a few minutes. Love the brand, bottle and everything, but it is just not my color! I feel kinda silly putting this gold-glittery champagne color on my lips, when all of my outfits go with pinks and reds; It smells delicious and goes on smoothly, without being too sticky, but the bottom line is that it basically just doesn’t do anything for me as I’m not a big fan of lip gloss. 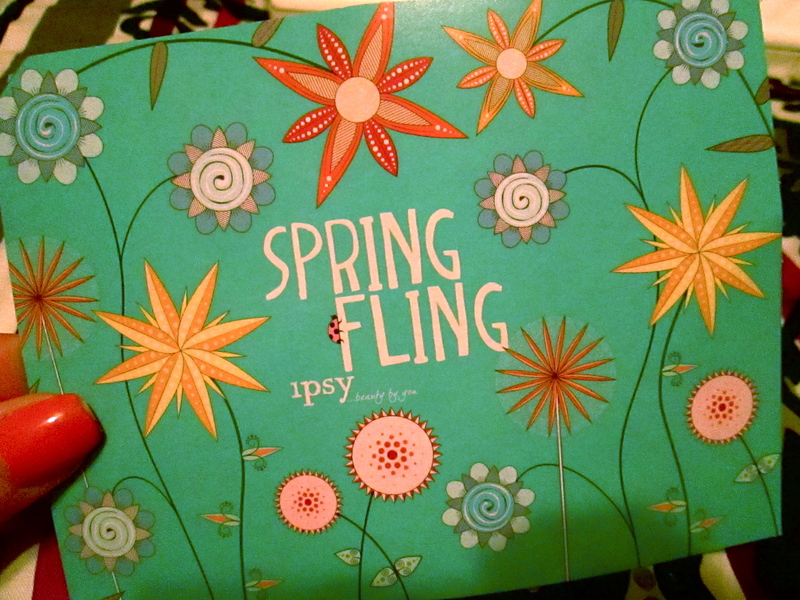 I almost wish it was a sample-size, however I may use the Ipsy Swap and see if someone would like to exchange colors with me. 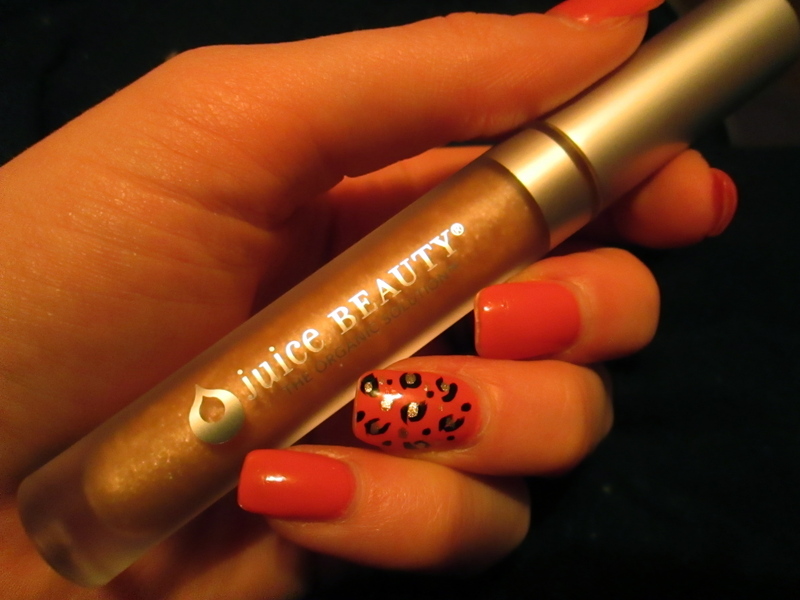 Rating: 3/5 Stars- It seems like a good brand, and is a great product if you like lip gloss. I would recommend it to someone looking for a simple gloss, but it’s just not my cup of tea. *I couldn’t figure out if this was a sample or “full size”, as nothing came with the concealer refill and it was difficult to find details on sizing. I think this little concealer pod is a great idea, and would have been even better if it was included with the prior months bag, as the bag included a magnetic make-up holder and mirror, and the concealer would have easily popped right into that. Otherwise, I can’t carry it around with me and it will end up at the bottom of my beauty closet! In general, the Ipsy girls did a good job trying to match up my skin color, and although it is a little on the light side, I can probably make it work. 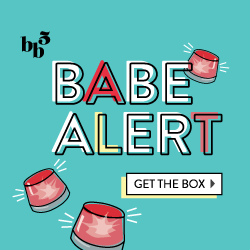 Rating: 3/5 because it requires a case (which you would have to purchase) and it doesn’t have any form of applicator. 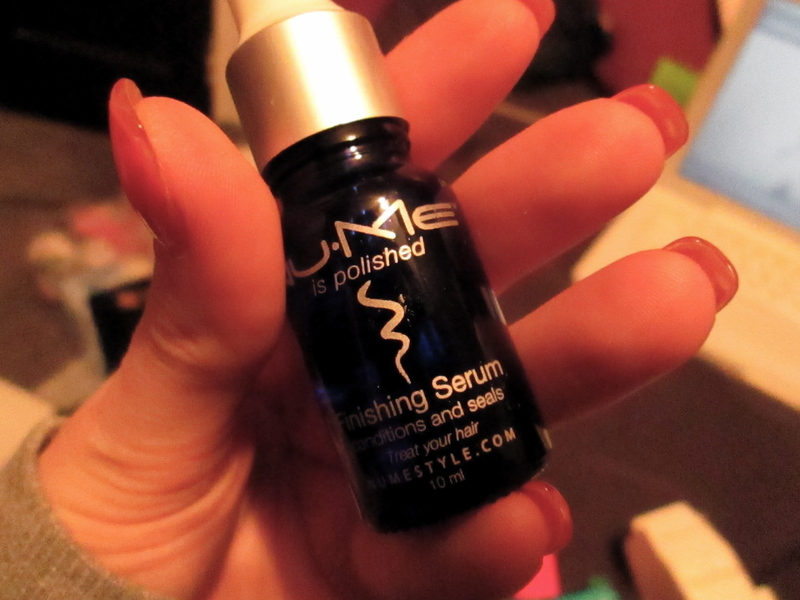 This serum was actually the perfect size despite it being only a sample. I was extremely worried about it being too oily or sticky, however it rubbed in smoothly, without weighing down my hair. I rarely use oils or serums, so I’m sure this will last me a long time, and it’s small enough to bring on vacations when my hair gets overworked from the sun and chlorine. Rating: 4.5/5 stars, good quality and size, I just don’t often use any serums. I’m giving it a higher grade/benefit of the doubt because I think many other fashionistas will like it! 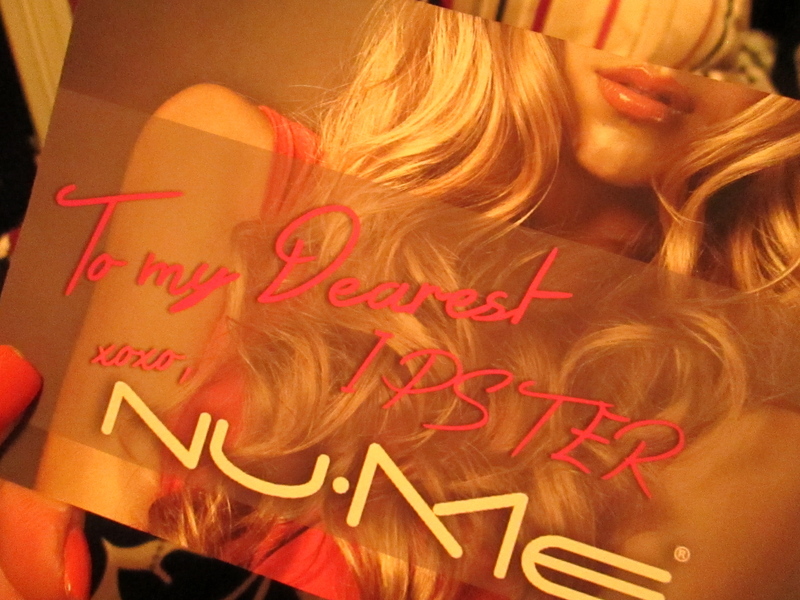 Plus, I got this discount card to be used on any Nu-Me products! 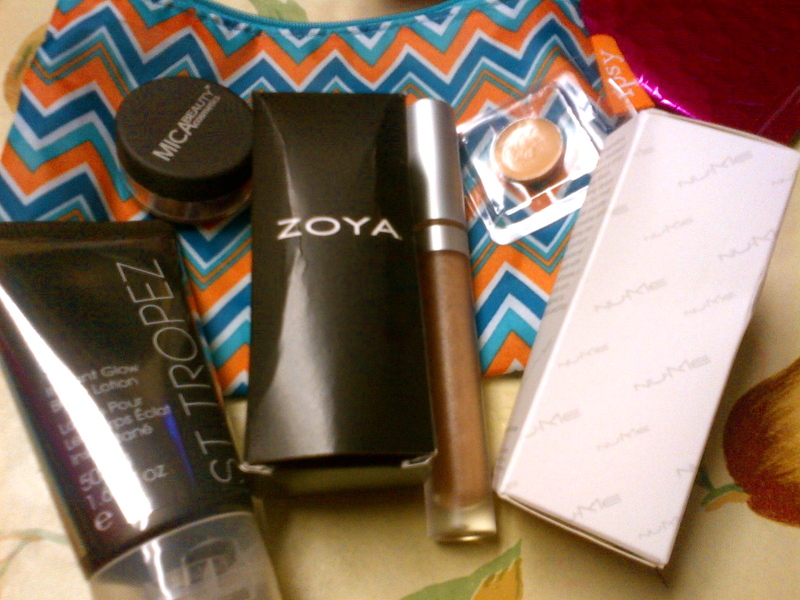 So all in all… when you include the custom make-up bag as well, the May 2013 Ipsy GlamBag gets a 4/5! This is definitely a subscription to get, and I can’t wait for next months! Thanks for sharing your box!